Corporate media attempts to drain us of all passion. We are constantly bombarded by images of shallow performers promoting fashion and consumerism attempting to silence our need to be nothing more than consumers and an exploitable workforce. Walking down the street we are surrounded in an appalling torrent of ads for musicians who have little interest in the dreams, hopes and desires of our communities; the same musicians who do not stand up to the injustices in the world that affect us. In this dark context Michael Franti's new album Songs from the Front Porch is an exuberant burst of light and inspiration. Michael Franti is mostly known for his politics, and we often forget to acknowledge his constantly evolving expression as a musician. Songs from the front porch invokes a sense of urgency in our journey for self-acceptance, and the need to challenge the violence in our lives and communities. His soothing voice combined with the masterfully produced rhythms encourages us all to find the courage to challenge injustice and speak out against forces that demonize our communities. In addition to Franti's amazing musical talent you also get the hypnotic beatboxing of Radioactive, the shake it bass of Carl Young, the eclectic expression of Dave Schulz on guitar and the gentle melodies of Bob Crawford on piano. The prolific messages of the CD are encoded in a brilliant combination of self-love healing songs and creative, political rebel rock songs. The track opens with the comforting track "Yes I will" which inspires us to speak out against those things that hurt communities and our selves and resist. Another track on the CD, "Love will set you free" challenges us to examine how our situation has been influenced by hate and encourages us to rise up to liberate ourselves. Also on the CD is the politically charged song, "Oh my God," which masterfully draws the connections between police repression, the rapidly expanding prison system and militarism in the U.S. on a delightful uplifting soul beat. 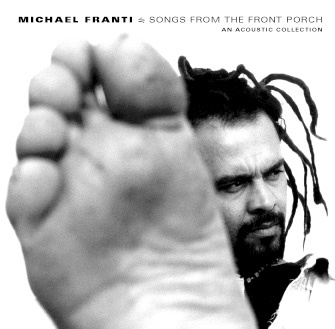 Songs from the front porch is also a shining example of Franti's growth as a musician. The album was self-produced and emphasizes Franti on lead vocals and guitar. As a poet and m.c. You can see Franti Franti's more complex style in the connotation of his voice and delivery of his lyrics. The CD is also an opportunity to experience the full force of Franti's magical calming ability on the guitar. The soft melodic guitar invokes memories of beautiful sunsets and having a good time with loved ones on the front porch throughout the whole album. The time is a perfect time to support Franti as a musician and activist as well. He just returned from visits to Iraq, Jordan, and Palestine to exchange thoughts with the peace activists of those countries. Corporate media has attacked recording artists for taking stances that were critical of the U.S. "War on Terrorism," and Franti has consistently been explicitly anti-war and pro Palestine. While in Iraq he played concerts to U.S. soldiers serving in Iraq encouraging them to be more vocal in their opposition to the war. I am sure he will support the peace movement and share his experiences and insights from his travel to war zones in the middle east. Michael Franti's music is music of resistance. He has decided to use it as a weapon against the power structure and in the struggle to heal our communities and encourage resistance to this unfulfilling way of being. His voice is one that sincerely wants to resonate with you and sustain you in the fight for change. Which makes the world look brighter. --Greg King is a writer from Tennessee.